Comments: Katherine Veith (Nee: Zindel) | PA | | Comments: "Mrs. Kate Veith" is inscribed on the back. 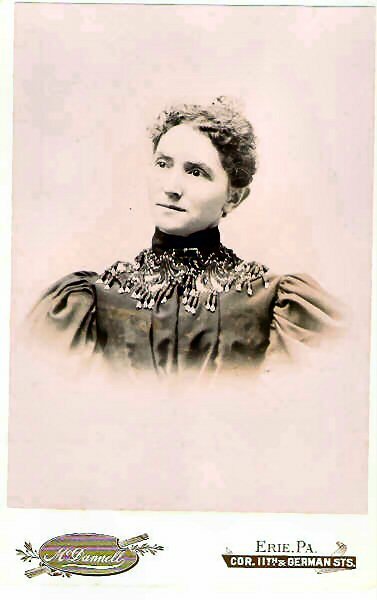 Katherine Zindel b 1850 was the daughter of Conrad and Elizabeth Babendorf. She married William Henry Veith b 1845. This family lived in McKean, Erie, PA. This photo album was submitted by Karen Zindel Sutton. Karen writes, This album is of the Zuendel/Zindels of Erie and Forest Co, PA. The pictures must all be relatives or descendants of the original family of Johann Heinrich Zuendel b 1787 and Dorothea b 1799.